School is very exciting at the moment! 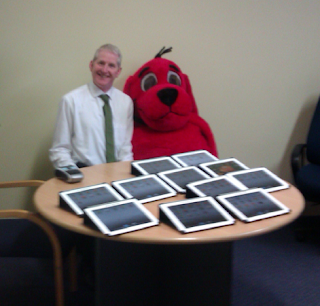 We have managed to access twelve I-Pads for targetted learnign programmes. I absolutely love that my boss is so hands on with the technological side of the project as well as the pedagogical side of integrating them into our programmes. I am very keen to hear from schools using materials in mathematics, especially tens frames and place value equipment as to how they might be integrating I-Pad technology to support learning. We are focussing on Years 0-4. Meanwhile, the senior team will be evaluating I-pads as a learning tool, their effectiveness, potential use and evaluating tools. How are you using I-Pads, right now?